An uncommon to rare mushroom in the wild, in Britain and Ireland Agaricus bisporus is found nearly always in grassland. 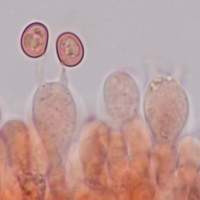 This species occurs also in mainland Europe and elsewhere in the world including parts of North America. The specimens shown on this page are cultivated 'Chestnut Mushrooms'. Although known for many years beforehand, this mushroom was recognised as a species distinct from the Field Mushroom Agaricus campestris by the Danish mycologist Jakob Emanuel Lange (1864 - 1941) in 1926; it was transferred to the genus Agaricus by German mycologist Emil J Imbach (1897 - 1970) twenty years later. Synonyms of Agaricus bisporus are many and includePsalliota hortensis (Cooke) J. E. Lange, Psalliota hortensis f. bispora J.E. 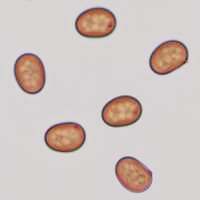 Lange, Psalliota bispora (J. E. Lange) F.H. Møller & Jul. Schäff., Agaricus campestris var. bisporus Kligman, Agaricus bisporus var. bisporus (J. E. Lange) Imbach, Agaricus hortensis (Cooke) Pilát, and Agaricus bisporus var. albidus (J. E. Lange) Singer. 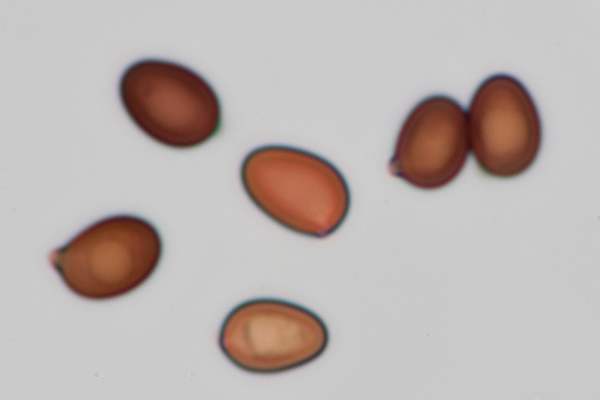 The specific epithet bisporus means having two spores - there are two spores on each basidium, whereas other Agaricus species (and indeed the majority of the Basidiomycota) have four-spored basidia. Initially hemispherical, becoming convex and eventually flattening. At maturity, the cap diameter is usually between 5 and 10cm. The crowded gills are narrow and free; initially pink they turn reddish and then chocolate brown as the fruitbody matures. At 3 to 6cm tall and 1.5 to 2cm. Below the insubstantial membranous double ring, the surface of the stem is flaky. Oviod to subglobose, smooth, 4-7.5 x 4-5.5µm. Two-spored - hence the specific name bisporus. Saprobic, in permanent pastures and other grassy places. Agaricus campestris, the Field Mushroom, is very similar but has four-spored basidia. It surely goes without saying that this is a good edible mushroom and one of the tiny minority of edible fungi that are considered safe to eat raw. 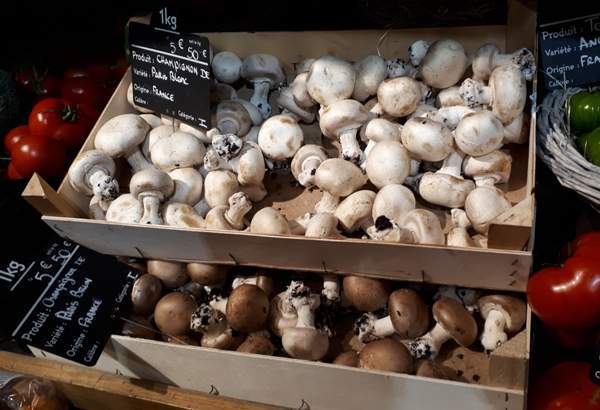 The very pale-capped mushrooms sold in most supermarkets are a derived form of Agaricus bisporus, which in the wild has a brown cap as shown in the main picture, above. 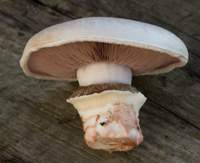 When fully expanded, the caps are sometimes referred to as Portobello Mushrooms (sometimes spelt Portobella).